If you’ve ever stood in your room, staring into your closet for prolonged periods of time, only to decide that you have nothing to wear, you may want to consider a capsule wardrobe. When most people get the feeling I’ve described above, their first instinct is to go out and buy new clothes. However, there’s something to the phrase “less is more”. Sometimes adding to the pile doesn’t create clarity, but instead just creates more frustration. Having too many options can sometimes be worse than having too few; hence, the beauty behind the capsule wardrobe. The idea behind a capsule wardrobe is that you have a limited number of clothing items in your closet that you swap out based on the season. Instead of staring into a messy pile of clothing, you create a smaller, more particular collection of clothes that are appropriate for the season and your lifestyle. It also goes along great with “quality over quantity” in your closet. Follow these five steps to create your capsule wardrobe and make your life easier so you’ll never have “nothing to wear” moments ever again. The best way to begin building your capsule wardrobe is by taking the time to examine everything you have. Take all your clothing, accessories, and shoes out of your closet. Lay it all out where you can see it. Not only will it ensure you finish the project, since literally everything is out of your closet, but it’ll also allow you to easily see and evaluate each piece before deciding its fate. Of course, your next step to creating a capsule wardrobe is sorting through everything you already have. Make four piles: keep, maybe, donate, and toss. Start going through every item of clothing and separating them into each category. Don’t take too much time to think, just go with your first instinct or you might begin convincing yourself that you every single item of clothing. Once complete, get rid of the toss and donate piles right away. Then go back to your maybe and keep piles. Ask yourself if you’d wear each item three months from now and if you’d buy it again. If you say no to either of those questions then that item should be tossed or donated as well. After you’ve separated everything, take any items out of your keep and maybe pile that aren’t in season. You won’t be getting rid of these items, but since you don’t need them in the moment, they’ll get stored away. This is the tricky part. 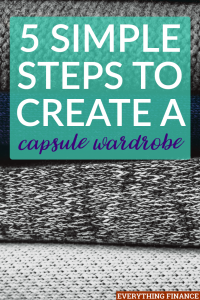 There’s a ton of different capsule wardrobe guides out there that each tell you a different number of clothes to keep in your capsule. You’ll hear everything from 20 items to 37, or even 50. When it comes to deciding on your capsule number, it’s important to evaluate your situation and daily life. If your job or life requires you to be prepared for a variety of situations, then you may need to go with a higher number of items. Take time to consider how many items you need, but again don’t argue for keeping more than you need, as that defeats the purpose. As a good rule of thumb, I’d go with about 33 items. It is important to note, however, that specialty items like a formal gown, ski pants, or sleepwear shouldn’t be considered in your capsule number, since those are items you won’t wear all the time, but still need at some point. Now that you have all the items you’re going to use in your capsule you can begin to plan specific outfits. This is the key to ensuring your capsule works, since you want to make sure everything fits well together. Make sure every item in your wardrobe can go with at least two more items, if not more, to make a variety of outfits. After all, a capsule is all about mixing and matching and creating outfits that you love and feel great in. A good way to do this is by either listing out your items and listing outfits or, if you’re ambitious, by taking pictures of outfits you can put together. A good tip is to start with shoes. Shoes sometimes make the biggest impact on a outfit, so starting from the bottom can be helpful. Once you’ve nailed down your capsule, begin wearing it for a while before doing any shopping. If you shop to fill any holes you might have immediately after creating your capsule, you might end up back where you started. Instead, wear what you have for a couple weeks or a month to figure out what exactly your style is and what you need to finish your wardrobe. Then, make a solid plan and shop only to fill in the holes. Remember, however, when adding something to the wardrobe, make sure you love it and that it fits superbly, because if it doesn’t, it’ll just take up space. Moreover, your capsule is always adjustable. If after wearing your chosen capsule for a while you decide you need a few more pieces, then add them. Nothing is set in stone, so feel free to adjust your wardrobe accordingly. The point of a capsule wardrobe is to make your life easier and to ensure you stop spending hours in front of your closet deciding what to wear. That being said, there are no real rules. It works best when you fit it to your personal style and lifestyle. If that means creating two wardrobes, one for work and one for casual, then so be it. A capsule wardrobe doesn’t mean you’ll never shop again or that you can’t keep something special just because you love it. You can do whatever is right for you. It’s merely there to simplify our already stressful lives. Who knows, it may inspire you to rearrange and simplify other areas of your life, or you may revert to your old, messy closet. Either way it’s up to you. Have you tried a capsule wardrobe? What are some of the tips you’ve found most helpful when building one? What does the HSBC buy out mean for you? Does Your Retirement Rely on the European Union?